TUESDAY, 5 APRIL – Public Universities have always been playing an important role in helping the government and people bridge the digital divide in the country. For this purpose, an International Seminar on Information and Communication Technology for Transformation (IC-ICT4T) 2016 was held at the Postgraduate Auditorium, Universiti Malaysia Sabah (UMS), today. 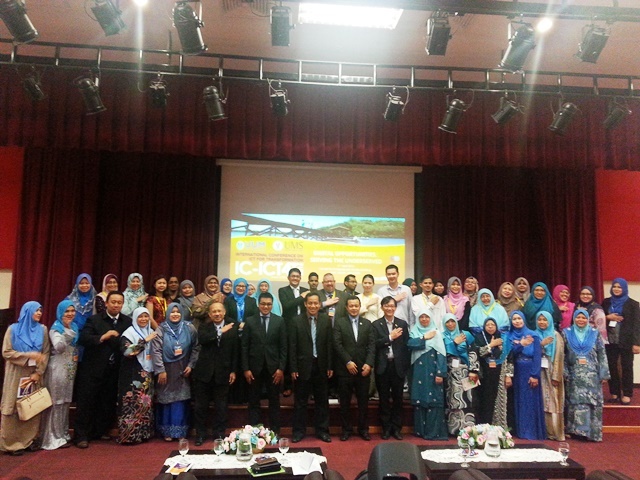 Vice-Chancellor of UMS, Professor Datuk Dr. Mohd Harun Abdullah said that this seminar resulting from a bilateral cooperation between UMS and Universiti Utara Malaysia (UUM) was among part of an effort that could contribute towards bridging the digital gap of society. “Looking at the title of the discussion, it is more focused on E-government and ICT services projects for those communities that lacked such services. Sustainability of such projects has been a challenge. “I thought we should use the concept of smart partnerships with government and private agencies in order to optimize this effort, generate high investment and improving the sustainability of planned ICT activities. His speech was read by the Deputy Vice-Chancellor (Academic and International), Professor Dr. D Kamarudin D Mudin. Datuk Harun said, the programme was also a support to the efforts conducted by the government such as the 1Malaysia Internet Centre (PI1M) and 1Malaysia Wireless Village (KTW1M) that provide internet access to rural communities.